A lot of the side hustles we discuss require a car, and that prevents a lot of people from doing them. And while it’s true that 95% of Americans own a car, that number has actually been declining in the last few years. With more people biking, using scooters, and taking public transportation, there is a growing trend of going carless (in fact, I sold my car and now Uber everywhere). However, if you’re looking to build a side income without a car – you’re probably going to have to use a bike or scooter. But it’s possible! Here are my five favorite ways to make money riding a bike or scooter. And depending on where you live (such as a big city like New York or San Francisco), some of these can be pretty lucrative. Uber Eats has expanded their delivery service to almost every city, and they’re looking for more than just drivers. They need people on bikes and scooters too – especially in urban cities like New York, New Jersey, Washington DC, Seattle, San Francisco, and more. The great thing about riding a bike for Uber Eats is that your expenses are much lower compared to driving a car. You basically don’t have gas and your maintenance is likely much less. It does require exercise on your part, but that’s almost a bonus. Depending on how much you deliver, you could earn a nice little side income. Sign up for Uber Eats here and see if there’s a bonus for delivering in your area. Sign up now. Instacart is similar to Uber Eats except it’s focused on grocery delivery instead of restaurant delivery. If you live and bike in an urban area, this could be a great way to make money riding a bike. Depending on your location and how much you want to work, Instacart advertises that bikers can work up to 29 hours per week. Instacart also provides bonuses for people who work 40 hours or more – which could be two weeks of deliveries. Postmates is an all-around courier for urban areas. You could deliver food, groceries and more. And if you ride your bike, not only will you get a great workout, but you’ll keep more of your money because you won’t have the expenses associated with a car. Postmates gives it’s drivers/bikers 80% of the delivery fee plus tips. On their website they advertise that you can earn up to $25/hour, which is pretty good money to be making on the side. Postmates still isn’t available everywhere, but they are expanded quickly. Check out Postmates here. Dashed is another food delivery service that is focused on the Northeastern United States. They compete with Uber Eats, but they aren’t across the entire country yet. However, if you’re a biker in this area, it could be a great place to check out if you can make money riding a bike for them. What makes then unique is that they advertise some of the highest pay in the industry. They do this by giving more money to delivery agents with higher review scores – so basically the better you are, the more they will pay you. It’s a neat idea. They advertise that you can receive $12 to $24 per hour. Check out Dashed here. Finally, have you ever thought about commuting to work by bike? Did you know that you might be able to get paid to ride your bike to work!?!? It’s your company’s discretion, but they can provide you up to $20 per month tax free to bike to work. There is a law called the Bicycle Commuter Act which allows companies to offer this benefit to employees. You can learn more about it here. Not only can you make money riding a bike outside of work, but you could potentially get paid to ride your bike to work as well! If you don’t want to use your bike, you can rent it out. It’s not making money by riding a bike, but it’s using your bike to make money for you. You can rent your bike on Spinlister and get $20 to $30 per hour or up to $100 per day. That’s not a bad way to make some extra money for not using your bike! What are your thoughts? 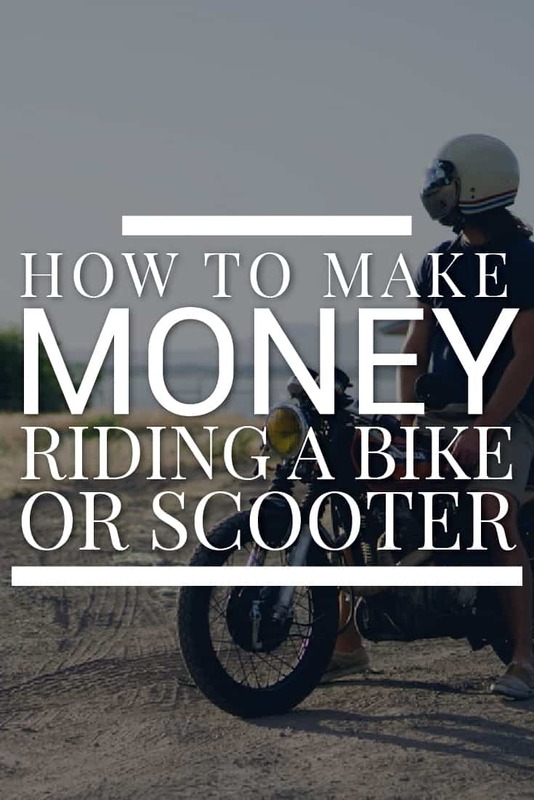 Have you tried to make money riding a bike or scooter?